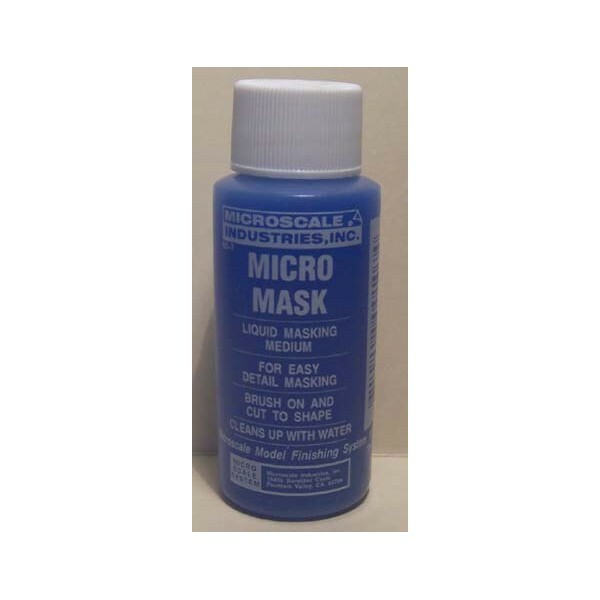 Micro Mask is like masking tape in a bottle. Just apply it with a brush, let it dry, and cut it to any shape you want with a sharp-pointed knife. Peel out the part where you want to paint, leaving an outer stencil mask, and paint with the method of your choice. 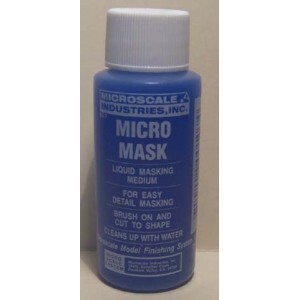 Just don't use a water-based paint over it because Micro Mask is water soluble, so use solvent-based paints. You can paint the finest detail you can cut with a knife. Unlike masking tape that can allow paint to go under it, even the most difficult designs come out sharp and clean with Micro Mask. An easy way to peal Micro Mask off, as soon as the paint is dry enough, is it to rub on a piece of masking tape and pull it quickly away. In difficult areas, you may just use water and a tooth brush and dissolve it away.